One last note about the contaminated bra clasp. There are some very interesting details about the protective suits that the investigators are wearing in the video. The most important information pertains to the shoe covers. The bra clasp was found on the floor. The shoe covers actually work like dust mops. This would mean that all of the DNA throughout the apartment would have quickly been spread from room to room. Shoe covers are designed to protect floors from shoe contamination. This means that they keep dirt from transferring to the floor from the shoe. However, any dirt on the floor will adhere to the bottom of the shoe covers. The covers quickly become dirty. 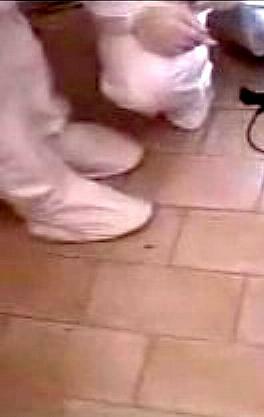 The investigators in the video do not change their shoe covers as they walk from room to room, thus causing even more contamination of the crime scene. The photo below shows one of the investigators standing outside. He is still wearing the shoe covers. Where else did he walk? How many people's DNA did he pick up on those shoe covers? Was he one of the investigators that kicked the bra clasp? Did he step on the bra clasp? The clasp was left on the floor for 47 days. The clasp was seen in several different areas on the floor before it ended up in a pile of garbage. Did this investigator kick it there? How many Investigators were in the house wearing these same shoe covers? The photo below also shows the investigator, still wearing his gloves, holding onto the railing. Did these investigators ever change their gloves? These are questions that will never be answered. Update: Court appointed independent forensic experts, Stefano Conti and Carla Vecchiotti, from Rome's Sapienza University, testified on appeal detailing gross negligence on the part of lead forensic scientist, Patricia Stefanoni. This testimony fully discredited the alleged murder weapon and the DNA laced bra clasp. 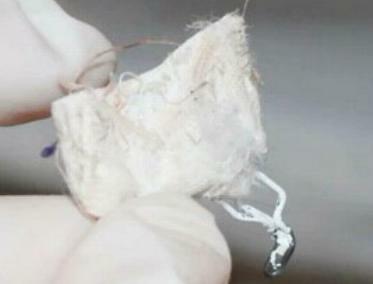 The prosecution used the bra clasp to show proof that Raffaele was in the room at the time of the murder. 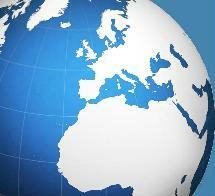 Raffaele's DNA was found on the clasp along with the DNA of at least four other people. After viewing the video showing the discovery of the bra clasp, it is amazing that it was even allowed to be entered as evidence. The clasp was not discovered until 47 days had passed. The clasp is seen in several different locations on the floor. The investigators made a mess of the room in previous searches for evidence. How they missed a piece of Meredith's bra the first time around is beyond belief. In the 47 days that the clasp was on the floor it was moved around the room and ended up in a pile of garbage. Keep in mind that this clasp also had cloth attached to it from the bra. This cloth collected dust for 47 days. Raffaele was at the apartment on several occasions. Finding his DNA in the apartment would be no surprise. Raffaele attempted to break down Meredith's door the morning that Meredith's body was discovered. Two of his finger prints were found on the door. Investigators most likely made contact with that door many times. As we know, the clasp was collected using dirty gloves. So in conclusion, the bra clasp tested positive for the DNA of Raffaele and most likely several other people that visited the apartment. In other words, the bra clasp proves nothing. This bra clasp is central to the prosecution's case. 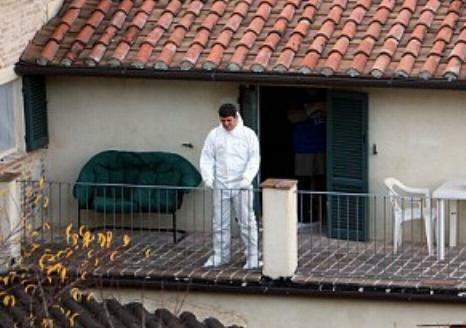 No other evidence links either Raffaele or Amanda to the room where the murder took place. This is a very important point. This piece of evidence has been proven to be completely useless. There is no evidence whatsoever placing Amanda Knox or Raffaele Sollecito in the room at the time of Meredith's murder. The videos below show how the investigators mishandle this piece of evidence. They pass it around with contaminated gloves and at one point even drop it back on the floor. 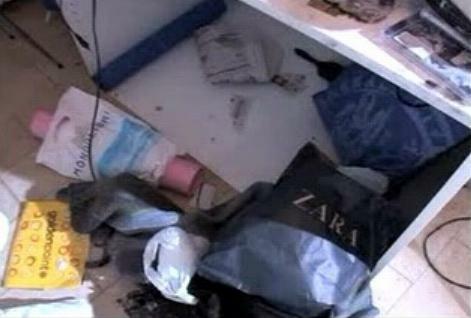 The picture below shows the bra clasp on the floor during the first search of the apartment. The bra clasp was seen in several different locations over the 47 day time frame. The clasp eventually made it's way under a rug next to the pile of garbage seen in the picture below. The investigators were in the process of cleaning up the remaining items in the room when the clasp was discovered. The apartment had been thoroughly trashed in previous searches. The pile of garbage below is right in front of Meredith's desk. In the videos you can see that the mess has been cleaned up. The investigators are seen shoving the remaining contents of the room into suitcases and bags. 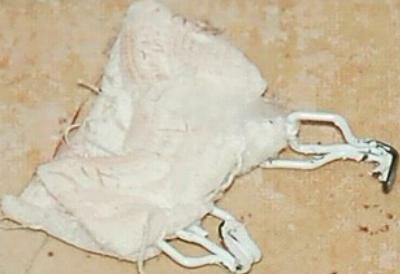 The picture below shows what the bra clasp looked like when it was finally taken into evidence 47 days after the initial search of the apartment. The clasp became dusty because it was found in a pile of garbage. Human epithelial cells are a major component of dust. No control testing of any kind was done, This type of testing would have been very easy. The clasp was retrieved from under a dirty rug. Testing other items from the pile of garbage pictured above to see if any of those items had also picked up DNA dust from the floor would help to show whether there was anything incriminating about the bra clasp. Of course, there was no testing done. As seen in the videos above, the investigators never changed their gloves. Those gloves quickly became contaminated. How many of those investigators touched the door to Meredith's room? Keep in mind, that's the same door that Raffaele tried to break down the day that Meredith's body was discovered. DNA from countless sources in the cottage could have easily been transferred from the gloves to the bra clasp. Here is another video showing the collection of the bra clasp. This video shows further proof that gloves were never changed. Watch what happens after the bra clasp is collected. Do the investigators stop and changes gloves? Of course not, they continue to collect more evidence. The investigators who handled the bra fastener didn't follow any proper guidelines for handling DNA evidence. Defense experts shredded this evidence during their testimony. It was easily proven that this piece of evidence was terribly mishandled. Any DNA found on the clasp was due to contamination.